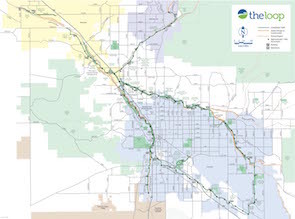 The Chuck Huckelberry Loop is a system of paved, shared-use paths and short segments of buffered bike lanes connecting the Rillito, Santa Cruz, and Pantano River Parks with the Julian Wash and Harrison Road Greenways. More than 120 miles of paved pathways and bike lanes have already been completed with an additional 11 miles planned or currently under construction. The Loop extends through unincorporated Pima County, Marana, Oro Valley, Tucson, and South Tucson. The connections are the result of Pima County's cooperative partnerships with these jurisdictions. The Loop connects parks, trailheads, bus and bike routes, workplaces, restaurants, schools, hotels and motels, shopping areas, and entertainment venues. Visitors and Pima County residents can enjoy the Loop on foot, bikes, skates, and horses. The Loop become “a real loop” in January 2018 when the County completed a connection on the south bank of the Rillito River Park between Glenn Street and Tanque Verde Road that connected the Rillito to the Pantano River Park. Connecting the Santa Cruz River Park with the Rillito, Pantano, Harrison Greenway and Julian Wash makes a complete circuit of 53.9 miles. Check out the all-new Loop Art Map! Pima County gets a number of questions regarding The Chuck Huckelberry Loop. These questions and responses have been organized by category with the goal of addressing constituent concerns. 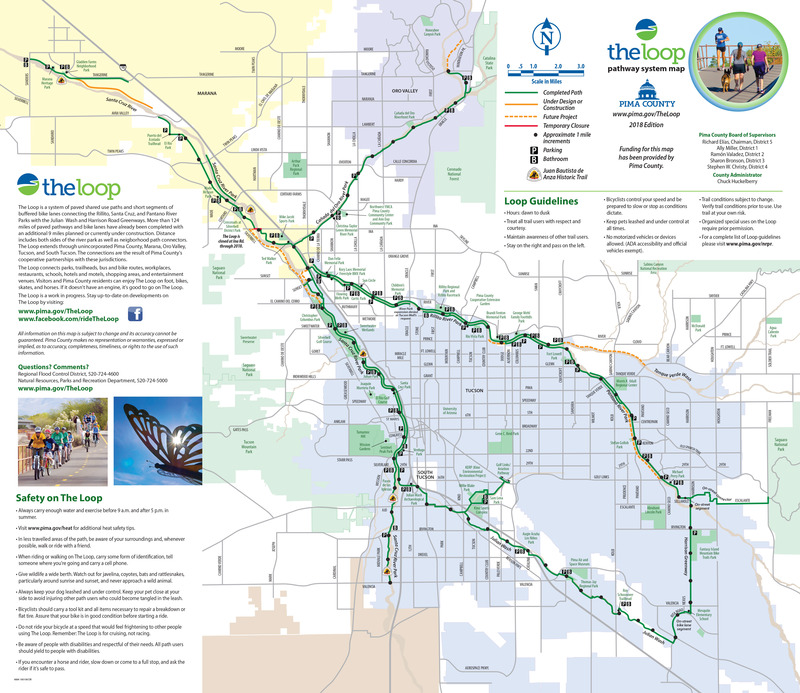 The Loop is a system of paved, shared-use paths and short segments of buffered bike lanes built on top of soil cement banks along metro waterways and connecting the Rillito, Santa Cruz, and Pantano River Parks with the Julian Wash and Harrison Road Greenways. After the significant flooding in the Phoenix area in the late 1970s, the state Legislature required counties to create special taxing districts to raise money for the construction of regional flood control improvements. Pima County began building soil-cement bank protection along the Rillito and Santa Cruz Rivers after the massive 1983 floods. How did that lead to the multi-use paths? Nearby residents were using the unpaved maintenance access paths on top of the banks to walk their dogs, go for a run or ride their bikes. The County started building river parks with improved paths on top of the banks, including pavement. By 1986, a paved section along the Rillito from Campbell Avenue east to Oracle Road was completed. This river park became hugely popular with hundreds of people using it every day. How long is the Loop? Many of the rivers have paths on both banks. Thus, when both banks plus connecting paths are included The Loop totals about 131 miles. When did the Loop become a real loop? In January 2018, the County completed a connection on the south bank of the Rillito River Park between Glenn Street and Tanque Verde Road that connected the Rillito to the Pantano River Park. What is the distance of that main loop? Connecting the Santa Cruz River Park with the Rillito, Pantano, Harrison Greenway and Julian Wash as a complete circle is 53.9 miles. How do I get on the Loop? There are dozens of places to access the Loop. To find the one closest to you, visit the Loop website pima.gov/theloop and click on the “Maps” tab. There you will find links to a Loop map in PDF form as well as an interactive map. The site also lists locations where you can pick up maps. Where can I find a restroom on the Loop? As of March 2018, the Loop had 15 restrooms found on the path and 20+ adjacent parks with facilities. You can use the Loop Interactive Map to find a restroom facility in the area of use. You also can check the printed Loop map by looking for the icons. Does the County rent bicycles to people wanting to bike along the Loop? No, but users can find plenty of bike shops that are located near the Loop through a quick online search. Many rent bikes on an hourly or daily basis. In addition, the Tugo Bike Share Program offers 330 bikes at 36 stations around town, several of which are located within a few miles of the Loop. Given the presence of these bike rental/sharing options in the area, the need appears to have been met. In addition, the County lacks the resources at this time to manage a bike shop and maintain a rental fleet. How do I know which way to go on the Loop? As with vehicles, you should stay on the right and pass on the left. Cyclists should announce their intent to pass by calling out “passing” and ringing a bell if they have one. Why do you have cyclists and pedestrians both go in the same direction? National guidance by the Federal Highway Administration indicates that pedestrians should walk on the right in the same direction of bicycle traffic when using off-street, shared-use pathways. In addition, other pathways within the region such as the Santa Cruz path, the Old Spanish Trail path, and the David Bell path around Reid Park have provided guidance since the 1980s for pedestrians to walk on the right in the same direction of bicycle traffic. I’m a pedestrian. It appears some cyclists ride much too fast on the Loop. What can be done about this? Most users abide by the Loop guidelines found on the Loop website. These signs are strategically being placed at a majority of our heavily-accessed entry points to promote courtesy guidance and encourage better behavior on trails. As a walker, you may be interested using the soft paths that run parallel to our asphalt trail. You may find these locations using the Pima County Loop Interactive Map and search in the Legend to find River Park Trails / “Soft”. These paths are more conducive to pedestrian use and dog walking. Please note, though, that if you feel your safety is threatened, call 911 and report it. Law Enforcement has assured us that this is the appropriate thing to do even though some of us would not typically classify these things as an “emergencies” warranting such a report. Although this type of report may not yield any type of citation, it will underscore with Law Enforcement that our citizens feel their safety is at risk and that additional patrols may be appropriate to mitigate potential hazards. Second, please report the incident using the Loop Feedback Form with as much detail as possible so we can record the nature of the offense and where/when it occurs. This information allows us to determine if patterns exist and, if they do, we can take certain actions. Those actions include directing our limited patrol and enforcement resources (via the Pima County Sheriff’s Office) into specific locations at specific dates or times, increasing educational or warning signage in select locations, or in some cases looking into developing capital improvements (path widening, traffic calming measures) into those areas if funds become available. Additionally, we do ask people to take notice and report any identifying characteristics about the offending entity or entities to us. This could include taking and sending a photo. Sometimes a group of similarly clad individuals may have identifying markings on their outfits that can be useful to us in order to track down the offending entity allowing us to target our educational efforts in a particular direction. Third, every Loop user needs to be aware that there will always be people who will not comply with our guidelines (as much as we try to inform them) and therefore be watchful and aware of their surroundings and be prepared for the unexpected. That is the tough reality of using a multiuse pathway but is critically important for every user’s personal safety. What do I do if I’m on my bike and encounter a horse? Slow down and ask equestrians if it’s safe to pass. Don’t ring your bell – it spooks horses. Can I get on the Loop whenever I want? The Loop is open from dawn to dusk. Night time use is prohibited. Can I walk my dog on the Loop? Does he have to be on a leash? Absolutely to both questions! It’s extremely dangerous, particularly for cyclists, if an unleashed dog darts out in front of them. Pets must be kept under control, not cross the center line, and on leashes less than 6-feet length at all times. Please be sure to bring a bag to clean up your pet’s waste. What do I do if I see a Loop user who isn’t following the guidelines? The Loop is a shared-use path, with emphasis on the word “shared.” Take a walk or bike ride along the Loop and you’ll likely encounter fellow pedestrians and cyclists as well as roller-bladers, joggers, dog walkers, parents pushing strollers and the occasional equestrian. The County has installed numerous signs reminding users of safety etiquette. You can also share your concerns at the Loop webpage - pima.gov/theloop - and clicking on the “Send Feedback” link on the right-hand column. Feedback will be shared with the Loop Advisory Committee, which works with County personnel to address general user concerns. Can I ride my motorcycle or electric bike on the Loop? No. The Loop is a multi-use path and is heavily used by pedestrians; therefore, for safety purposes, no motorized vehicles or devices are allowed. (ADA accessibility and official vehicles are exempt.) The Loop moves between the city of Tucson, Marana, Oro Valley and unincorporated sections at various locations along the path. In September 2018, the city passed an ordinance, #11582, relating to electric bicycles. The ordinance permits riding an electric bicycle on shared-use paths under the jurisdiction of the city of Tucson. However, the sections of the Loop within the City of Tucson incorporated limits and in unincorporated Pima County are under the management authority of Pima County and the Pima County Regional Flood Control District and the use of electric bikes on the path is prohibited as declared on our Loop Guideline signage. Applying this guideline for all stretches of the Loop retains a level of needed consistency and promotes the safety and well-being of all users. Equally, for safety purposes, this guideline applies to any and all motorized or artificially-propelled devices (ebikes, scooters, hover boards, skateboards, etc.). Pima County is working toward proposing a comprehensive County Ordinance that would prohibit motorized vehicle or device use on any stretch of The Loop. Can a person with bad knees or a condition like arthritis use a pedal assist e-bike on the Loop? The Americans with Disabilities Act defines a disabled person as one who has a physical or mental impairment that substantially limits one or more major life activities, one who has a history or record of such impairment, or one who is perceived by others as having such an impairment. Pima County’s Natural Resources, Parks and Recreation oversees maintenance of the Loop. Our Loop Guidelines are intended to set the “motorized vehicle or device” standard at that legally-determined “disabled person” level so as to create an unambiguous statement of Departmental intent that motorized device use on the Loop is only authorized if the user believes that they possess a condition that meets this legally-defined standard. For all intents and purposes, a person with a disability and their motility device using Pima County multi-use trails and pathways are considered by Pima County to be pedestrians by our guideline. The goal of NRPR is to be as inclusive of all users as possible on The Loop while retaining the necessary element of safety for everyone using The Loop whether on foot, horseback or on wheeled devices. This would include allowing Loop users to utilize select electric motorized devices if they can prove a “demonstrable medical need.” An example would be a user who is temporarily rehabilitating from knee surgery or who is otherwise in chronic pain due to a documented medical condition. NRPR recommends that any Loop user carry sufficient documentation of their medical condition which necessitates use of a motility device. Therefore, if a user believes that his or her condition would either constitute a disability under federal ADA definition, or otherwise meet the definition of demonstrated medical condition as outlined herein, and he/she possesses documentation of that condition, then it should be acceptable to use a motorized motility assistance device under our published Loop guidelines. What other rules govern use of the Loop? Who takes care of cleaning up the Loop? Pima County Regional Flood Control District (RFCD) has funded and built the Loop within our river park system as a recreational amenity for community use. Pima County Natural Resources, Parks and Recreation (NRPR) is under contract with RFCD to provide maintenance service to the Loop path, landscaping, restrooms and adjacent parking lots. Who handles clean up down in the riverbed? The Regional Flood Control District manages overall regional watercourse maintenance efforts. They don’t generally do “spot” clean ups, but instead work those clean ups into into their maintenance of long segments of watercourses. How do I contact them if I spot debris in the path or some other issue? Report the incident using the Loop Feedback Form. Try to be as specific as possible on the location of the issue you spotted. You also may report it via the Loop’s Facebook page. Who do I contact when I see homeless individuals camping along The Loop or in a county park? How do county officials handle homeless issues? Notify Regional Flood Control officials with an incident report, photos and locations. Issue a trespass notice, often in coordination with law enforcement, that allows individuals time to remove their belongings and move. Connect individuals with services offered through Pima County Behavioral Health and the Sullivan Jackson Employment Center. Remove any solid waste and contact Pima County’s Department of Environmental Quality. If the issue is discovered outside the county’s jurisdiction, then the appropriate personnel are notified. Where do I suggest improvements to the Loop? A Loop Advisory Committee was established in 2017 to address user concerns and look at future improvements to the pathway. Email the committee chair or share your suggestions using the Loop Feedback Form. Have you thought of installing mile markers along The Loop? The entire trail is marked via GIS mapping on the Pima County-Natural Resources, Parks and Recreation Loop Interactive map. This map has many fields and features including mile markings down to .25 miles. Part of the problem with physically marking all stretches of the Loop is the fact it follows several water courses (Santa Cruz, Rillito, CDO, Julian Wash, Pantano, etc.) in several jurisdictions (Marana, Oro Valley, City of Tucson, City of South Tucson, Pima County). Likewise, many sections of the path are only on one side, not both sides, of the riverbed. The Loop Advisory Committee meets several times a year and has continued to debate the topic of marking the path. Many of the existing directional signs give good measurement to points of reference. Where can I find the latest construction and maintenance updates? You can find these under “Notices and Closures” on the Loop website, the Natural Resources, Parks and Recreation website or on the Loop Facebook page. How do I make a donation to improve The Loop or fund a memorial bench? The Parklands Foundation is a non-profit organization that helps protect and enhance the parks and riverparks in Pima County. Visit their website at: pimaparklands.org. Get your Loop gear here! Before proceeding to The Loop Store, we recommend reading through our FAQs and checking our sizing chart. Please be advised that ALL SALES ARE FINAL. Click on the image at left for a larger map of the Loop (updated November 2018). ALERT: The Julian Wash path southwest of Kino Environmental Restoration Project (KERP) is subject to flooding when it rains, and debris may be present on the path. Use caution. Pima County’s Natural Resources, Parks and Recreation Department has launched a mobile-friendly interactive map of The Loop that will let users track down everything from the nearest restroom to trailhead access points to entrances for horses. Use the map or click on the image at left. Click on the images below for larger maps (updated January 2018). The "Celebrate Art" map offers a self-guided walking and biking tour of artwork in and around downtown Tucson, within easy access of The Loop. All maps are also available at Natural Resources, Parks and Recreation, 3500 W. River Road, and at the Communications Office, Administration Building, first floor, 130 W. Congress.